Taman Melawati residents: Central park on or off? PETALING JAYA (Sept 13): Taman Melawati residents are still seeking clarity about plans for a convention centre that will be built on a site earmarked for a central park, following recent remarks by Selangor Menteri Besar Datuk Seri Mohamed Azmin Ali. On Sept 11, Azmin told Free Malaysia Today that the Selangor government will not “rush through” the construction of a convention centre in Taman Melawati in lieu of an earlier proposed public park beside Melawati Mall. “I give my undertaking that we are not going to demolish or scrap the proposed development of the park. “In fact, I sacrificed my service centre to be dismantled and develop the park. So they are in the process of getting all the papers and documents in,” he said. However, Taman Melawati residents remain unconvinced with Azmin’s statement, said the neighbourhood’s resident association in a press release today. “[Azmin] is not giving us the whole picture and he has given confusing statement because the proposed convention centre also allocates a green space or recreational area or a mini-park,” said Razman Hakimi Abdullah, chairman of the Residents Association (RA) of Taman Melawati for Jalan ABC. “So is this the ‘park’ on the Selangor MB service centre that will be sacrificed as stated by [Azmin] on Monday? “Please tell us the truth and please be clear, [Azmin]. Is the plan for a convention centre beside Melawati Mall still on or the plan for Melawati central park still alive? “Or is [he] telling us that the plan for the convention centre is now cancelled? When [Azmin] was giving his assurance that the ‘state government won’t scrap the proposed development of the park’ — is the Selangor MB talking about the new location for public park behind Jalan C1 as the alternative site after cancelling Melawati central park? “Our position is clear — the Melawati residents want the plan for Melawati central park to be revived because we want to have a central park beside Melawati Mall and not a convention centre,” he said. Melawati Mall is located at Jalan Bandar — according to the shopping centre’s official Facebook page — which is about a seven-minute drive from Jalan C1. The RA also questioned the accuracy of Sime Darby’s statement released last Saturday (Sept 9) and the lack of transparency by MPAJ and the state government. Last Saturday, in response to Melawati residents’ protest, Sime Darby released a statement stating that MPAJ had approved the layout of the public park in 2014, but was later told to change its plans. “In 2016, a decision was made by the state government and local council for a convention centre to be constructed at the location identified for the public park. “We were informed that the public park was to be relocated to a site next to Serini Melawati, a residential development by Sime Darby Property,” Sime Darby said in a report by The Malay Mail. 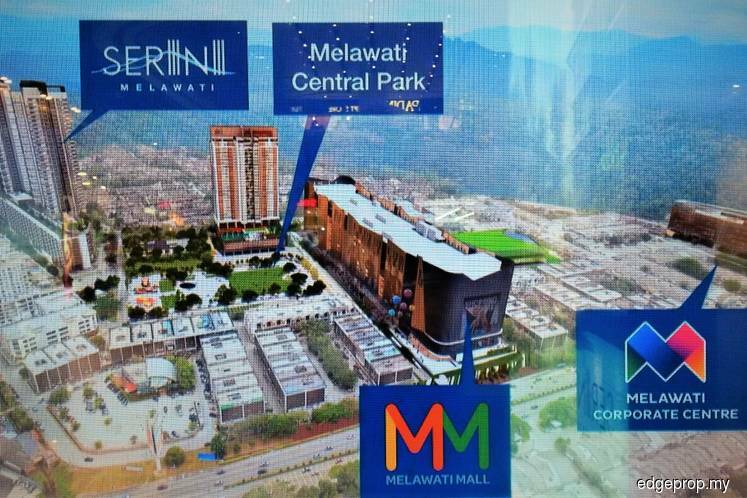 Serini Melawati is being built less than 1km away from Melawati Mall. Interestingly, in an interview with EdgeProp.my published on March 31 this year, Sime Darby executive has confirmed that “Serini Melawati is located close to a brand new central park Melawati”, Razman Hakimi pointed out. “So which is true now?” he asked, adding that the RA has a “strong inclination” that the decision for a convention centre by MPAJ and the state government was only made in April this year. “Taman Melawati residents want clear, transparent and precise information from Menteri Besar of Selangor and our Member of Parliament for Gombak [Azmin] and/or MPAJ so that we can move forward and get Melawati central park back on track,” he said.